Cosy 2-family house "Holzwurm". In the district of Terassenweg/Klusi, 1.5 km from the centre, in a sunny, elevated position, located by a road, south facing position. In the house: storage room for skis, washing machine, tumble dryer (for shared use). Linen change (suppl. charge extra). In Winter: please take snow chains. Stepped path (30 steps) to the house. Roofed, parking at the house. Shopping centre 1.5 km, restaurant 300 m, bicycle rental 1.5 km, bus stop "Klusi" 100 m, railway station "Grindelwald Dorf" 1.9 km, indoor swimming pool 1.8 km. Golf course (9 hole) 3 km, tennis 2.5 km, minigolf 1.7 km, sports centre 1.8 km, mountain railway 1.9 km, gondola lift 1.6 km, ski rental 700 m, ski bus stop 100 m, ski school, children's ski school, ski-kindergarten 700 m, cross country ski track 2.5 km, ice field 1.8 km, children's playground 1.8 km. Well-known ski regions can easily be reached: First 1.5 km, kleine Scheidegg/Männlichen 4 km. Well-known lakes can easily be reached: Thuner-/Brienzersee 20 km. Please note: ski bus (free of charge). Free ski bus service to the ski region First and kleine Scheidegg/Männlichen. Please note: There are more similar properties for rent in this same residence. 2-room apartment 35 m2, on the ground floor, south facing position. Practical and cosy furnishings: living/sleeping room with 1 sofabed (140 cm, length 200 cm), Scandinavian wood stove, cable TV and electric heating. Exit to the patio, south facing position. 1 room with 1 double bed (2 x 90 cm, length 200 cm). 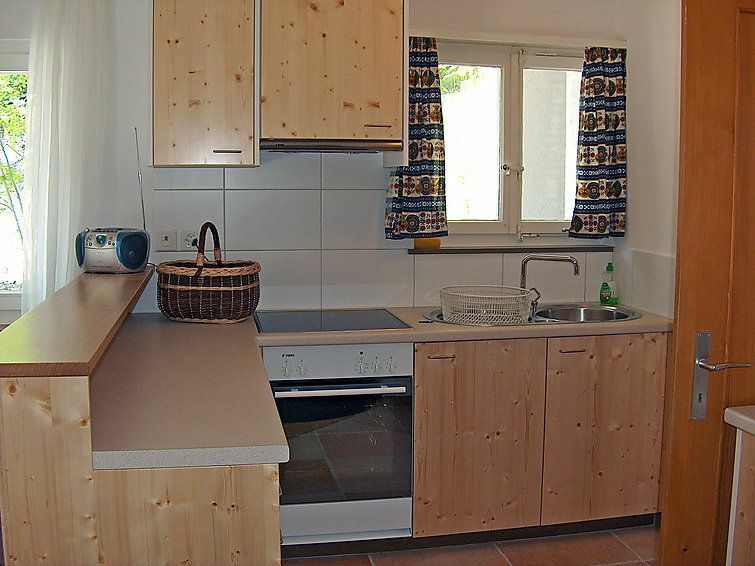 Open kitchen (oven, 4 ceramic glass hob hotplates, electric coffee machine, raclette grill fondue Set (cheese)). Shower/WC. Electric heating. Patio, south facing position and west facing position. Terrace furniture, box-room. Marvellous view of the mountains. Facilities: baby cot for up to 1 year olds. Internet (WiFi, free). Reserved parking (roofed) at the house. Please note: non-smokers only. Fire extinguisher. Compact tidy apartment close enough to the shops and centre not to be isolated but far enough away to enjoy some peace and the views. Prettige woning voorzien van belangrijkste voorzieningen. Prima verblijven met een klein gezin. Ich musste am Ende noch 170 Franken extra zahlen, die bei der Buchung nicht erwähnt wurden. Ausstattung gut, etwas zusammengewürfelt. Busverbindung super.